It’s What to Wear with… Wednesday! With fall in the air (okay, not really but a girl can totally dream!). Let’s switch that and say…with fall on TV and fall on my heart, it’s time to start thinking about that fall wardrobe. The crazy part about going from summer to fall is the transition. There’s those days where it’s not super hot, but there’s just enough breeze in the air. And you’re so sick of those shorts and sandals that if you have to look at them one more time – much less wear them – you’ll scream. No? Just me? Anyway, as I was skimming through my Instagram feed I stopped dead in my tracks at a pair of peep toe ankle boots from Sole Society. They’re from Julieanne Hough’s line (she’s my hair idol) and I love them. The heels might be a little high for you and that’s okay. The point is the shoe type. An ankle boot is the perfect pair of shoes to transition you into the fall. So, what do you wear them with you might ask? Here are some ideas for you! You can wear ankle boots with a dress or skirt. Layer a dress with a jacket, like the moto jacket I featured a couple of weeks ago, and add a pair of ankle boots. This is a great way to transition a summer dress into the fall. It’s still warm enough for the dress, but you need a little something to cover those arms and you need something to cover those toes. Voila! The perfect outfit. You can wear ankle boots with dressy pants and a structured jacket. Wear pants that are similar to capris, but a little dressier. Such as these side zip pants from Jones New York. Layer your outfit with a structured jacket and this is the perfect work and about town outfit. 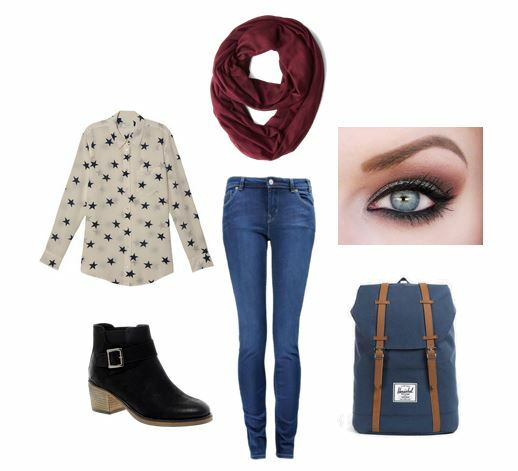 You can wear ankle boots with skinny jeans, a casual button up shirt and a scarf. This is my favorite go-to look since I’m a work-at-home mom. Just put on your favorite pair of skinnies, change up your button up shirt and scarf from time to time and you have a different outfit whenever you want. Are you ready to give ankle boots a try? Which of the three of these is your favorite outfit?